Yesterday, you saw a smiling photo of me at the finish of my impromptu 10k. So why was I so unhappy at the finish? And I was unhappy. Very unhappy. Was it as simple as me being really disappointed in my performance? Sure. Was I also disappointed that I didn't do the second loop? Yeah, I guess. But it was a fun run. There are two issues here: why did I do so badly, and why was I disappointed? 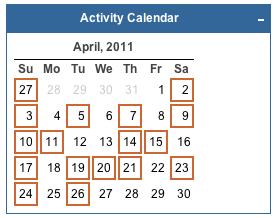 Screen shot taken directly from my training log... notice that the highlighted days are days that I ran. Four times a week for the entire month of April. Barring some sort of disaster afflicting me in the next three days, I will have run 100 miles in the month of April - the most I've run since, um, a long time ago (I didn't run that many miles in November, and I ran two marathons in November). So there you have it - the period of consistency I've been dreaming of. I'm in a groove. My runs are great. I'm enjoying it. I'm looking forward to increasing my mileage even more in the next few months. So, naturally, I expect my race performances to reflect this. Immediately. Like now. Today. Yesterday. 3. Lack of sleep. Seems to be a refrain for me, but last week was particularly bad. Consider that I was still up at 2:30am the night before the race. And that I'd slept only about 5 hours Friday night. 6. No desire to race. It's true. I'm still over racing. If I'd gone into this as a fun run, I probably would have had a great time. But with that number pinned to my chest, I felt unprepared and inadequate. When I lay it all out like this, it's easy to say that this was a one-off. I'm still disappointed in myself; I just didn't have it in me on Sunday. I have a massive soft spot for our military, and the race benefits a good cause (building homes for injured veterans). Use the code SPARTAN11 for $5 off registration. But congrats on the mileage - I've only run 200 miles THIS YEAR so far. How scary is that race name? I don't want to race like a Spartan. Spartans DIED. Anyway, you've got all the pieces - consistency, a good sense of perspective, knowledge of what to do next - so you're half way there, right? Honestly? I think what I need to do is to not race. Period. To just enjoy running for running, to run fast when I want to and not care if I sometimes run slow. I think I need to put the Garmin in the closet for a few months (or more) and just enjoy running. Of course, that said, Yonkers training starts in like two weeks. Yep. You need to not race in the HEAT. Summer running kills joy. Yes, it's that simple. Or, you know, it could be that you don't want to do it and doing painful, time-consuming things that you don't want to do is a little silly. If I had realized this, I could have saved myself $$$$ in the past year. We had a trainer who is a runner come to my weight management meeting tonight. He was focusing on diversity of training. He said that basically you have to change how you're training every six weeks or you reach a plateau. This not on includes things like speed workouts, long runs, etc., but doing strength training, stretching, in order to keep your body from plateauing in its performance. But you're right in that if your goal is to run until you die (i.e. well into old age) enjoying it has to come before any consideration of performance. I put my heart rate monitor away, but I still run with my Nike Plus so that I can monitor distance, calories and time to record and turn in at my weight class. Hi. Someone told me that you sound just like me, and I agree! Fun, fun--negative self-evaluation with lists and such. :) I'm adding you to my blog reader and predicting good things in your running future.